Since 1975, first under the brand SANYO and since 2012 under the brand Panasonic, we have been a pioneer of the photovoltaic technology. Here you can find some milestones of our involvement with solar energy. Investing in photovoltaic modules is a long-term commitment. Ideally a solar module has a life span of 25 years and over. That makes the relationship with your PV manufacturer almost as durable as the one with your life partner. In order to keep this relationship successful and enjoyable, your PV manufacturer needs to be a partner you can rely on. With 42 years of expertise and experience, Panasonic Solar is a pioneer and technology leader with a unique track record in reliability. Now celebrating it's centenary year in 2018, Panasonic Solar are hoping to continue as a leading manufacturer for the next 100 years. HIT® provides many years of reliable operation over the system's entire life cycle. Out of more than 3 million modules supplied in Europe alone, the failure rate is less than 0.004% (as of January 2018). The heart of each Panasonic HIT solar panel is our solar cell. In 1990, scientists at SANYO started developing the heterojunction technology. This is an improvement on the classic monocrystalline cell, using different materials than a crystalline wafer in the p-n junction. This invention addresses the key point in a solar technology: reduction of losses at the boundaries of the cell. With this improvement, our heterojunction cells have been continuously breaking records of efficiency and performance at high temperatures ever since. In March 2016, Panasonic set the record for efficiency of a solar panel in commercial size with a panel of 275W (aperture area of 1.1562 m2). From the hugely popular Panasonic company, comes this 295W monocrystalline panel. The highest efficiency silicon panels available, combining mono-crystalline layers and amorphous layers to provide higher power outputs and smaller panels. Unbelievable 25 year product warranty on offer! 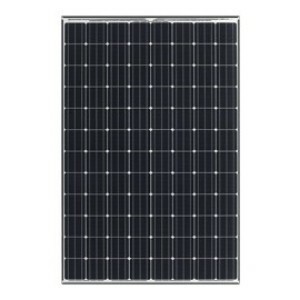 From the hugely popular Panasonic company, comes these 330W monocrystalline solar panels. These hybrids are the highest efficiency silicon panels available, combining mono-crystalline and amorphous layers to provide higher power outputs and smaller panels. Unbelievable 25 year product warranty! If you need more information on warranties and panel dimensions, check out the individual panel pages.